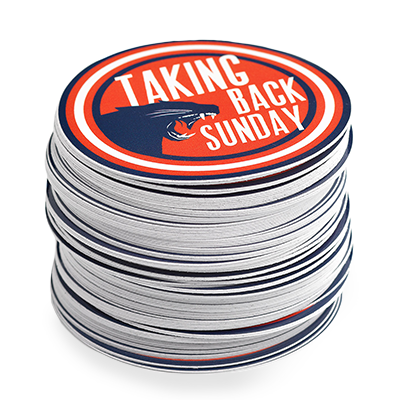 Hangable sticker packs in just 8+ days. These custom sticker packs are ready for hanging on POP displays or art show booths. Coming in a tad over 5x7", each pack features six full-color stickers with a gloss topper card with either a hole punch or a sombrero punch. If you expect your stickers to live outdoors, ultra-durable sticker stocks last 3-5 years outdoors. I have to be here because Magento is a turd. Personalize your sticker packs with print upgrades. Can I order clear stickers with white ink, only? You bet! Set up your white ink as a white spot color. See our in-depth white ink blog post. Can I order a custom-sized sticker pack? How do I setup my custom shape?